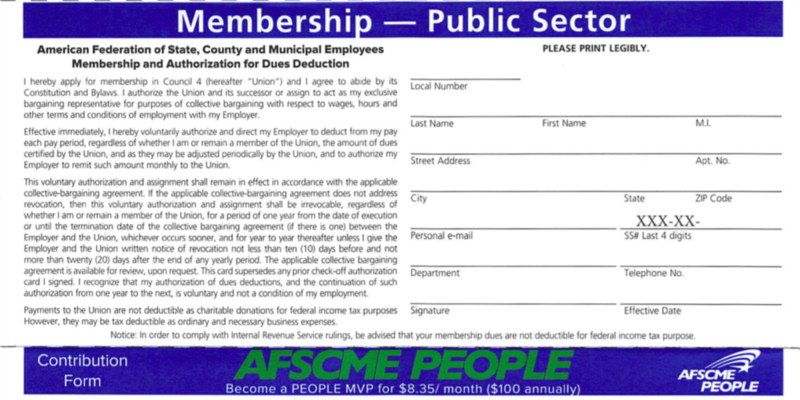 New state and municipal employees might want to read the fine print on AFSCME union membership cards before signing. The membership cards authorize one of the state’s largest public-sector unions to automatically deduct dues even if the employee resigns from the union in the future and places restrictions on when an employee can cease paying those dues. Employees who sign the card will only have short window of 10 days before and 20 days after the employee’s yearly membership anniversary during which they can resign. Similarly, the American Federation of Teachers’ “re-commit” cards for Connecticut’s Administrative and Residual Employees Union say members can only resign from membership during the month of February. Language restricting public sector workers’ ability to resign from a union may prove problematic in the wake of the Supreme Court’s Janus v. AFSCME decision. Janus v. AFSCME ruled public sector employees can resign from union membership without being forced to pay dues or fees based on the First Amendment right to free speech. Vice President of the National Right to Work Legal Defense Foundation Patrick Semmens says that unless union cards are “very explicit that they’re signing away their First Amendment rights,” the language may be legally questionable. “We believe the way that card is written, the limitation on cutting off union dues payments should not be legally enforceable,” Semmens said. Semmens also says it is questionable whether or not the windows apply to union membership or the collection of dues. “They can’t restrict the ability to resign from the union, the question is whether they can restrict when you can stop paying dues,” Semmens said. The fine print of AFSCME cards say dues will be deducted regardless of whether a worker remains in the union. A court case out of Pennsylvania broached the subject of resignation windows and dues for public sector unions in 2007, when the court granted an injunction to cease dues collection from plaintiffs who were only allowed a brief 15-day window prior to the end of the collective bargaining agreement to resign from the union. 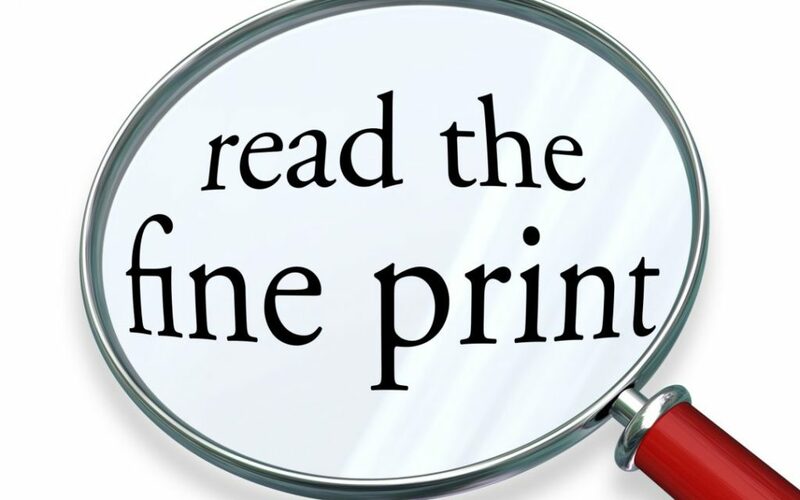 The plaintiffs in the case – members of Turnpike and Public Employees Union in Pennsylvania – submitted union resignation letters but were not allowed to leave the union under a “maintenance of membership” provision in the collective bargaining agreement and continued collecting full dues. The judge ruled this provision “may have a direct and deleterious impact on plaintiffs’ rights under the First Amendment,” and ordered the union to cease collecting dues until the case could be litigated. The National Right to Work Legal Defense Foundation represented the plaintiffs in the Pennsylvania case, which was eventually settled. Typically, resignation windows revolve around a member’s anniversary date of membership, which is different than their employment anniversary; under these restrictions, members have to find their anniversary date in order to resign. But in the wake of the Janus ruling, restrictions on membership resignation and dues deductions could be called into question. The Janus ruling also said new public-sector employees must affirmatively “opt-in” to the union by signing membership cards, but Semmens says the language on the new cards should be explicit and clear what rights they are waiving. “Anything less than that would violate Janus,” Semmens said. These unions are run by thugs who have no regard for member rights. For years, these unions have been under the control of Democrat operatives who have used forced dues and their control of union pursestrings to advance the interests of the party they favor. Unlike private sector unions, public sector unions have a selfish vested interest in growing government because bigger government and higher taxes redounds to the benefits of unions and their bosses’ fat salaries. In unguarded moments, labor thugs have admitted that their unholy alliance with the Democrat Party gives them the ability to elect thei own bosses, i.e. those who will give them what they want, and the taxpayer be damned. Like “card check” this is just another devious method of controlling members and extracting dues against their members’ wishes. Janus would never have happened if Crooked Hillary was president because she, like public employee union bosses, would treat public employees and citizens alike as compliant sheep. Thanks for the heads up to those unaware! I gave myself a $65 a month pay raise by getting out of union and put that into my monthly 401k contribution! Do your own calculation. I gave them 11k over the past 12 years (your welcome) and now its time to save for my own family.